Large feast on the various events in the lives of people, often accompanied by lots of snacks. Mistress trying to please them, so choose the best varieties of meats, but before the celebration can occur the problem of their attractive covers. Cut bought deli meats. For this you need a sharp knife with a wide blade. You can choose a knife with a smooth edge or jagged to make the pattern of meat when butchering. The pieces should be thin and even, otherwise lay them nicely does not work. Keep the sizes of all of them was about the same. Take a wide dish with a smooth surface. Lay the cutting on grades, respecting a certain structure. You can divide the dish into sections, or to shuffle the meats. Each piece should go to the previous (lay them overlapping). Remember that meat on the plate would appear to be a roller coaster of meat pieces should lie flat. Add color. Decorate the plate with sliced vegetables. You can make them flowers, or just cut and lay track. This is perfect cucumbers (of which you can make a spiral), tomatoes and radishes (flowers), and olives. All they combine perfectly with meat, so the taste will not be spoiled. Try to lay out cuts, made her rolls. This will perfectly fit slim crowbar ham or ham. You can simply wrap them and secure to the skewer with an olive, or add the filling inside. Just mix mayonnaise, cheese and garlic, put a piece of bacon and carefully wrap. Put the meats on a bed of greens. The brightness of dishes will whet the appetite and attract attention. On a plate lay out a few varieties of salad (lettuce, iceberg, Romaine), separated into leaves. Then put the cutting in straight lines in a circle so that the pieces lay overlap. You can combine meat and cheese plate that will give more scope for imagination when laying on a dish. 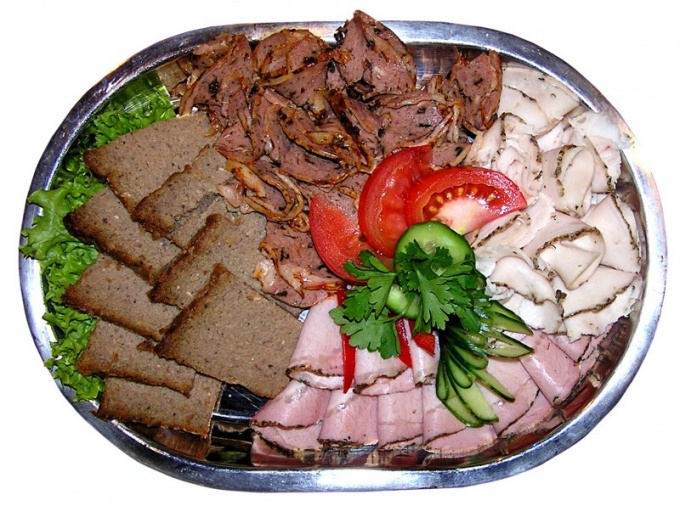 The butcher plate, it is customary to include the following types of products: pork, ham, smoked sausage, Turkey, ham, chicken roll.